Anil Kumar Singh IAS, his transfer order from Delhi to Lakshwadeep(UT Administration) has been kept in abeyance for furher period of three months by the Ministry of Home Affairs, Government of India. 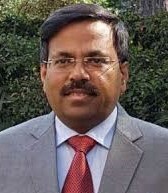 Anil Kumar Singh IAS officer AGMUT 1995 batch, who is presently posted as CEO Delhi Jal Board, Government of Delhi his transfer order from Delhi to Lakshwadeep(UT Administration) has been kept in abeyance for furher period of three months by the Ministry of Home Affairs, Government of India. He will be relieved on 30th June 2019.